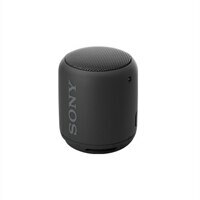 Sony SRS-XB10 - Speaker - for portable use - wireless - blackWherever you go, bring some big beats with you. The SRS-XB10 is easy to carry and gives your music some extra bass. Get things going with EXTRA BASS. A passive radiator works with the monaural speaker to enhance low-end tones, giving bass a boost - despite the compact size. The SRS-XB10 is compact and wireless so it's easy to move. With a long battery life and a water-resistant surface, you're free to pick it up and put it anywhere. Whether you're listening to tunes indoors or outdoors, relax knowing the wireless speaker is water-resistant. Thanks to its compact size, you can pick up the speaker, pop it in your bag, and take it anywhere you want.